Karel Appel was one of the founders of the radical CoBrA movement that thrived across Copenhagen, Brussels and Amsterdam in the wake of the Second World War. Rebelling against the rules of the old avant-garde, this loose collective of artists embraced a raw, expressive style inspired by the spontaneity of Jean Dubuffet, art brut and primitive art forms. Appel was at the forefront of this movement in Amsterdam alongside Asger Jorn and Constant. 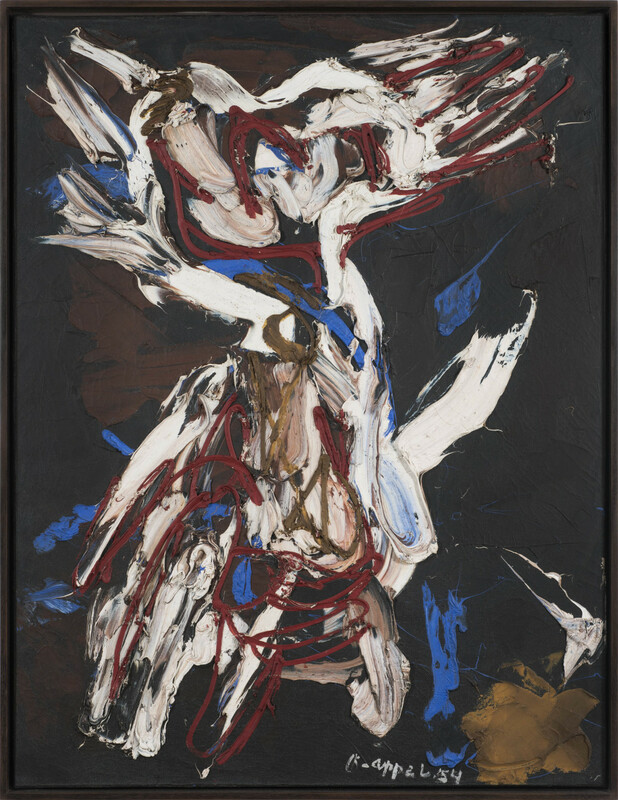 ‘Personnage dans la tempête’ (meaning ‘Person in a storm’) was painted in 1954 at a critical moment in Appel’s career. 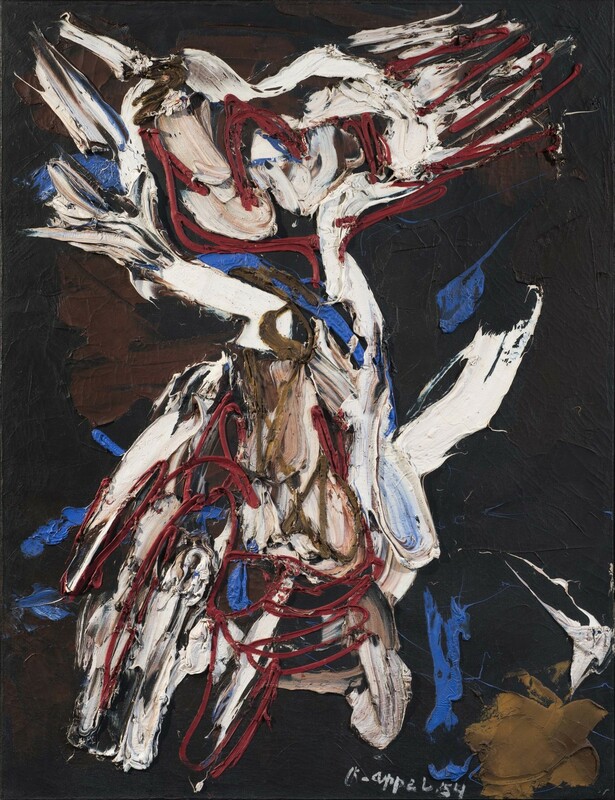 With the CoBrA movement largely dispersed, Appel began to turn to New York and the lively movement of American Action painting for inspiration during the 1950s before moving to the US in 1957. The present painting was one of the pivotal works featured in Appel’s first solo exhibition in New York in 1954 at the Martha Jackson Gallery. This show essentially launched Appel’s international career and collaboration with Martha Jackson, who continued to represent the artist in America for over twenty years. In the same year Appel was awarded the UNESCO Prize at the Venice Biennale and produced a number of his most important works including ‘Wild Horses’ (Thyssen-Bornemisza Museum, Madrid) and ‘People, Birds and Sun’ (Tate, London). In his introduction to the Martha Jackson exhibition catalogue, celebrated French critic and Art Brut curator Michel Tapié describes the ‘’glowing and explosive beauty’’ of Appel’s work, filled with exuberant marks of thick paint across canvas. During this period Appel’s painting style took on a new strength and tormented energy that is apparent in the uninhibited marks of vivid colour across ‘Personnage dans la tempête’. With slashes of red, blue and black that struggle against pure white, Appel conjures a furious storm that seems to trap a beast in the eye of a tornado. Appel explained this thundering energy within and outside saying, “To paint is to struggle constantly with oneself”. Appel is considered one of the most important Dutch artists of the 20th century and has been the subject of major retrospectives: at the Palais des Beaux-Arts, Brussels (1953); Centre national d’art contemporain, Paris; Stedelijk Museum, Amsterdam (1968) and Kunsthalle Basel (1969). Following global recognition at the Venice Biennale, he went on to receive the Ljubljana Biennial graphics prize (1957) and Guggenheim International Award (1960) and was the subject of his first complete monograph in 1962.